Ready made quilting patterns are fun, but you may want to make your own quilting or crafts design at some time, but just cannot concentrate to figure out how. We usually make our own quilt designs, sometimes because we want a different size, and sometimes because we just like to create. We can share some ideas with you here. Start with some squares in colors you want to work with. These are just some recent fabrics I washed, so they will give you an idea of what you need. We also use freezer paper and muslin. Freezer paper makes the first design, and muslin gives a backing to the sample square. We have folded the fabric pieces in the picture on the upper left so you can see the potential for even a simple quilt block. You can make a unique quilt pattern, or this specific design. Another way to make your own design is with freezer paper and a ruler, pencil and compass. Decide the size block you want to make and mark the square for the completed size. After you make the design, cut all the pieces and add 1/4 inch all around to make a template for each pattern piece. Stitch a sample block before you decide to cut more. If you like the look, you did it yourself! Cajun Christmas ornaments are a little difficult to find, but making your own is easy. You may want to use felt or fleece, or wood and a scroll saw. Choose a theme for your Christmas ornaments. The Cajuns are known for alligators and the chicken chase, Mardi Gras and food. You can choose a theme for your tree, and colors you want to decorate with. You may choose to do all animals, or all farm animals. Make it fun, and conversational. We usually draw shapes by hand, but if you don't feel confident with drawing your shapes, use a cookie cutter to draw around, or look for shapes on the internet. Children's coloring books also have great outline shapes for felt Christmas ornaments. I usually just draw one side on the felt, fold it in half, and cut both sides at the same time. This corrects any distortion from the free-hand drawings. Get a jump on Christmas this year, and craft your ornaments from safe and practical felt or fleece, or wood if you prefer. Have a great time crafting your felt Christmas ornaments this year. Always free fun, and free help. 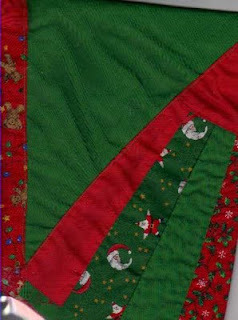 Creating a Christmas tree skirt is almost a no-sew project the way we do it, but there is some crafting to it. These skirts are made of whatever you have available or whatever you can find, so they are perfect for frugal living or low budget fun. Measure to determine the size Christmas tree skirt you will need, and then look around your house for an item that you can use. Look for a circular vintage crinoline or can-can, or maybe an old poodle skirt. Any circular skirt will do. A round tablecloth will also work fine. Use your imagination, and if you have to, you can make a trip to the thrift store for a circular item. Cut a slash down one side and hem each raw edge. A tablecloth requires a hole in the center where the skirt already has the hole at the waist. Fold the tablecloth in half and in half again. You will need to cut a quarter circle, but not large. Most of the Christmas tree holders do not need more than a 5 inch diameter hole. That is 2 1/2 inches cut from the folded tablecloth. Press and hem around the circle or add a bias binding tape and leave "ties" like an apron. We will be sharing more Christmas crafts on this blog in the next few weeks. We have been working on some Cajun Christmas ornaments and crafts this week. Happy crafting! Quilting crafts should not have to be rushed, but sometimes we need a gift and a quilt is expected. You know how this works if you are a quilter--new baby, person just back from the hospital, friend of a friend--and they do not realize that these quilts take time. Lots of time. Getting started and thinking through the project is half the work. Here are some ideas that may help the next time you need to make a quilt in a hurry. Consider using a large scarf or picture in the center. This may save you hours of stitching. 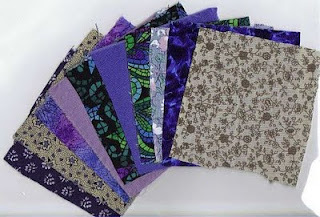 Find quilt blocks that are already made. Many are available on the Internet, sometimes vintage and beautiful blocks. Tie the quilt if you do not have time to quilt it, or just quilt a line around each block to hold it in place. This may give you just the inspiration you need to get a quilting project started that you can finish in time for the occasion you need it for. I usually have a quilt in progress, but often have to stop on that one to do a "quickie" for a friend. Bet you do, too. If you would like to crochet, but are intimidated by those coded instructions from the usual directions for crochet, you might want to try magic crochet. 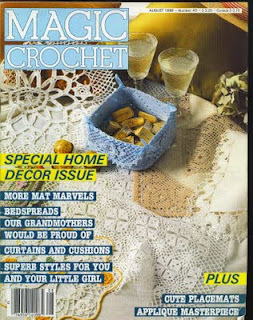 Magic Crochet magazines were a subscription for years, but have been discontinued, I believe. The idea behind the magic crochet instructions is to provide a line drawing with the information on the row you are working. Magic Crochet is a great magazine, and the idea is to help visual learners, or people who just don't want to follow those little coded instructions. We sell Magic Crochet back issues on a marketplace website if you would like to start crocheting or pick up where you left off. Magic Crochet back issues are available here. 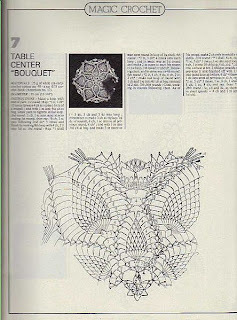 The Magic Crochet magazine has full-page line drawings to follow, and instructions in the back to understand how the drawings can guide you in crocheting. Most of their projects are thread crochet, like doilies and tablecloths, bedspreads and fine crochet work, so the picture instructions are really helpful. See what the instructions look like at the top of this page. Crochet has been one of my favorite crafts for many years, and I have made doilies and baskets, afghans and pillows. Even doll clothes are fun to crochet! 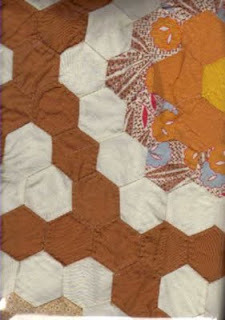 Grandmother's Flower Garden is a hexagonal pattern quilt and is an old favorite. Sometimes I want to use this pattern in a different size than the size quilting pattern I have available, so it has been really convenient to know how to make my own pattern without doing any serious calculations. 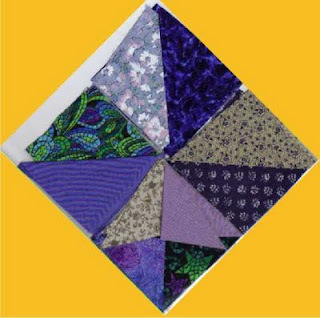 Use a 2 1/2 inch, 3 1/2 inch or 4 1/2 inch square to make a 2 inch, 3 inch or 4 inch hexagonal shape. Cut the square and fold it accordion style in thirds. Fold in half from the adjoining side to create a perpendicular line. Your paper square will have six sections or folds. Draw the quarter inch seam all around the square. With the three-part division at the top, draw a line from the line 1/3 across to the center inside line where the stitching will be. Do the same from the center line to the 1/3 fold at the bottom. You will create a > and a < on each side to make the hexagon. The picture to the right is a Grandmother's Flower Garden quilt with what I call the garden path variation. I used vintage squares for the flowers, and since there were not enough of them, I added a muslin row and the brown rows between the flowers to make the quilt large enough. This is an example of one of the uses for a pattern of a different size--if you have blocks already started and need to add more. You already know we like needlework and sewing crafts. Quilting is one of my favorite pastimes, and I never have enough time to share all the things I have learned over the years. 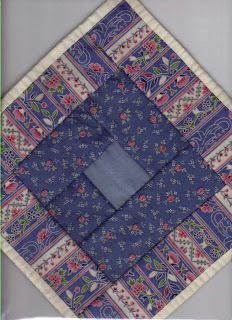 Grandmother's Fan quilt is one of the old quilting patterns that has lots of versatility. I saw this pattern for years as a child--actually worked on the blocks for a couple of them, and have inherited the blocks from 1956. You can make a fan quilt pattern in the size and with the number of folds or spokes of the fan that you want. We used seven spokes in the fan, but that is really more sewing and does not look any better than six spokes. In recent years, I have made a pattern or two in different sizes with a different number of folds or spokes. If your fan block is a quarter of a circle, that is 90 degrees, so six spokes would be 15 degrees each and five spokes would be 18 degrees. You can do this with very basic math. One of these days, we can look at the versatility of the fan quilt pattern and novel ways to use it. 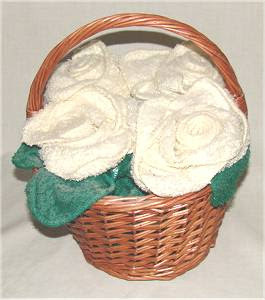 A washcloth flower basket is fun for the bathroom or fun to give away. It takes about a dozen washcloths in colors to match the bathroom, and requires no sewing. This is so easy, it should be listed in kids crafts somewhere, but I have never seen it anywhere but in my own bathroom. I made these several years ago, and have changed them a couple of times. After you make a couple of these, you will wonder why you didn't do this years ago. If you don't have any washcloths to spare, make some from old towels. Just roll the washcloths to shape the flower of your choice. Experiment for different flowers. Wrap in a green washcloth and tie with a rubber band on the "stem" side. Make some of these for Christmas gifts--inexpensive and easy crafts and you made it yourself! Have fun with this crafts project. See you in a day or two! Have you ever tried to sew something by hand and the thread just keeps twisting? I have seen great seamstresses have difficulty with this, and some suggest beeswax and all kinds of novel treatments to the thread. What you really need to know is how to put the thread in the needle. Yes, you probably already know how to thread the needle, but do you know that every thread has a twist that only runs one way? We have an article about this subject to help if you have twisting thread when you sew. You already know how? Do not cut the thread off the spool until you thread the needle. Then cut the thread and knot the end you just cut. It can make a difference in your hand sewing work. 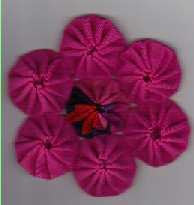 Yo-yo flowers are fun to make and can be done by hand sewing. Actually, they look better when hand-sewn and with larger stitches. See how these individual pieces spiral around? That is because they are stitched with large enough stitches that they look like they are pleated. The great thing about these flowers is that you can do whatever you want with them. They are great on pillows or on sweat shirts and sweat shirt jackets, too. They also are used for quilting. Yoyos are great fun and you can make them in any size you want. 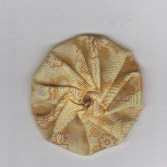 They start with a circle, sew around it with a single turned hem about 1/4 inch, pull it almost closed, and tack. Once you have a few yo-yos made, tack them together from the backside for a large flower. Each flower takes seven single yoyos. Click on the link to see the step-by-step instructions. Quick and easy use for your sewing machine: If you still iron a few of your shirts and blouses, and are constantly working with the front facings to keep them pressed, why not just sew the facings in place? Even if you don't iron your shirts and blouses, some of them have facings that wrinkle and keep creasing in the dryer. For the last several years, I have been sewing the facings down to keep from having to iron them. Pin the facing to the front and press. Sew down the front on each side to keep the facing in place. Do this the next time you have the sewing machine out to work on a crafts project or new quilting adventure. You will be glad you did. Once you learn to sew, it seems that the crafts possibilities are endless. Many sewing projects become essential to keeping up a household. That includes alterations, particularly to children's clothing, and mending anything from socks to curtains. Another great use for the sewing machine is in recycling. If you have towels that are frayed along the edges and no longer look good, they are ideal for recycling or as they say, repurposing. Each worn towel can make several washcloths, and at the price of washcloths, this is worth the effort. You can find make washcloths from old towels by using a purchased washcloth for a sample size. Cut the washcloths from the part of the towel that is not badly worn. As a fun crafts project, you may want to make something from vintage pillowcases. You can make doll clothes, a purse, or a blouse embellishment with a little imagination. You can also think up your own ideas, like an apron for the holidays. The embroidery work is already done on the pillow cases, so you have a head start! Make it fun and productive, too!